One of the very few names that can be recognized by the majority of online gamblers from the nineties is Captain Cooks Casino. This is one of the best online casinos that opened up in the late nineties and they have continued to provide their players with the very best gaming quality. The casino is operated and owned by the Casino Rewards Group, while they also have a licensing out of Canada with the Kahnawake Gaming Commission. The Casino is available in multiple different languages such as Italian, English, French, Spanish, Portuguese and more. The casino has also gotten the seal of approval with eCOGRA which means that the games you play are tested annually, the casino offers multiple banking and currency options and every time you play at the casino its safe. Ever since the day Captain Cooks Casino opened way back in 1999 they have managed to see growth year after year. They now have a very strong player basis that is full of players who are loyal and return to the casino on a daily basis. Some of the reasons why players continue to play at the casino is because Captain Cooks Casino offers incredible promotions, higher payouts than most online casinos, offer visually impressive games and so much more. This has led to Captain Cooks Casino becoming one of the leading online casinos available under the Microgaming platform. 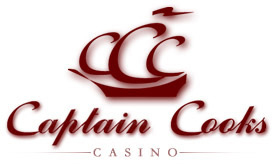 Overall the Casino Rewards Group has done it again with Captain Cooks Casino. This online casino takes gambling to a whole new level with its impressive qualities all around. You will be able to access a large library of games that all offer the highest of graphics, you will be able to access promotions to get more money out of your game and so much more. Microgaming is the software of choice for this Casino Rewards Group online casino. This is far from being a bad thing though as Microgaming is by far the top contender in the online casino software industry. The software now has over six hundred and fifty different online casino games to offer to those who play using the software. They will release new games every single month ranging anywhere from two or more, which means you will always have new content to access. There will be multiple different types of games you can play that include Poker, Blackjack, Roulette, Keno, Slot Games, Progressive Games, Table Games, Card Games, Bingo and others. Every single one of these games will provide you with extremely impressive visuals, a high level of sound quality, strong speed performance, exciting in game features and more. When the time has come that you finally want to create an account with Captain Cooks Casino then there will be two options for you to choose from. There is an instant play version of Captain Cooks Casino which will offer you hundreds of games that can be played from any computer around the world. Then there is a downloadable version of the casino which will give you access to every single one of games available under the Microgaming library. You will notice there is a good range of depositing and withdrawing methods with Captain Cook Casino. You will be able to deposit and withdraw with e-wallets, direct banking transactions, prepaid cards and credit cards. There is also support staff that is highly educated and available to you 24 hours a day, every day of the year. You will be able to receive a $500 Free Cash Bonus when you first sign up with the casino. This will let you play the bonus for one full hour and whatever you win you keep. There is also a $25,000 Giveaway Contest that any player is eligible to win and finally you can sign up with the Casino Rewards Reward Program which will give you the chance to access exclusive promotions, exotic trips around the world, your own VIP Manager and so much more.